The watermelon was known and cultivated in Europe during the Roman era. 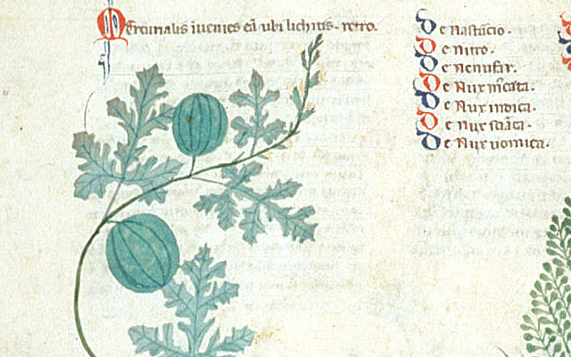 The first drawing of a watermelon in European documents was in one of the copies of the Tacuinum Sanitatis (a 13th-century text derived from Taqwīm as‑siḥḥah تقويم الصحة ). Watermelon was also being cultivated in India in the 7th century and in China by the 10th. (!!) I also found a 14th-century recipe book (in medieval Catalan, gods help me) with candied watermelon. If we stretch our region to Northern Africa and the Levant, we can find that 5,000-year-old watermelon seeds were found in an ancient settlement in Libya. Watermelon was a fantastic way of storing water for long journeys or droughts, as the fruit last a very, very long time before going bad. 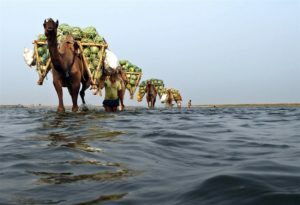 They are a good choice for sea voyages or crossing the desert. 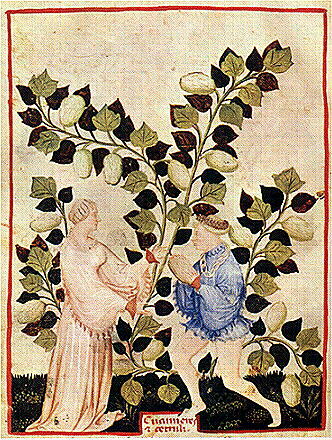 Watermelons used to be rather bitter, but that bitterness was tied to a single gene, making it easy to breed out. 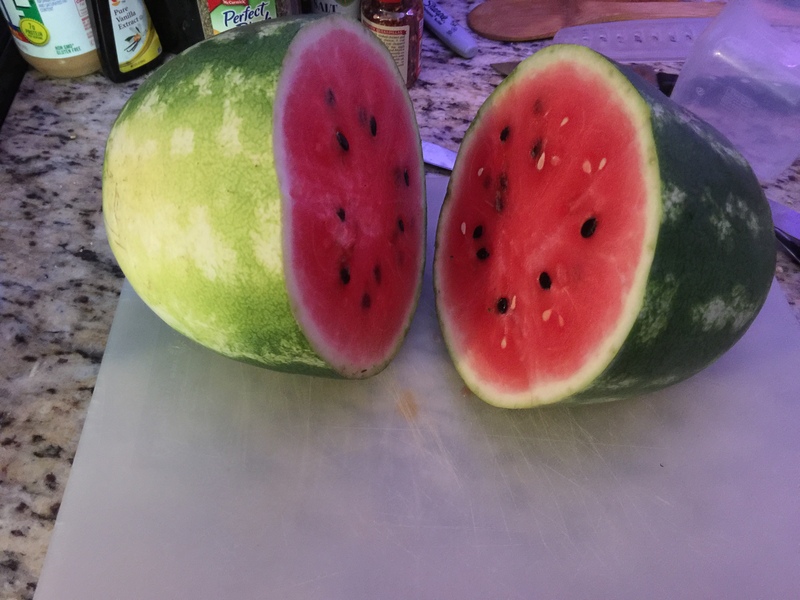 Interestingly, that gene also controls the color of the flesh of the melon; it turns it to the familiar red we know and love. It made it very easy tell if a watermelon was going to be sweet or not. Watermelons were used to treat heat stroke in children; Hippocrates (you know, of the Hippocratic Oath?) recommended the rind be placed on the head of an overheated child to help cool them down. 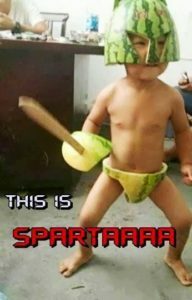 So, we now have documentable evidence that children have been wearing watermelon helmets for at least 2500 years. Watermelons were mentioned in the Jewish Bible (Christian Old Testament). We know that watermelons reached India by the 7th century CE and China by the 10th century CE. 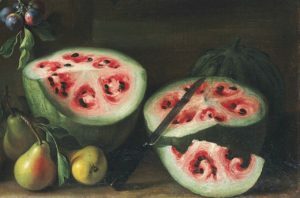 Watermelons are often held up as examples of how humans have been manipulating plant genetics for centuries, usually by showing this painting by Giovanni Stanchi. 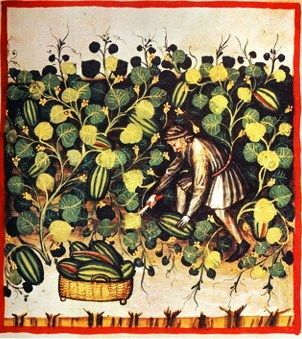 We also have watermelons in illuminated manuscripts, such as seen here. While I have yet to find reference to watermelons being used in cordials, it’s not beyond the realm of possibility that someone, somewhere, created one just to see how it would turn out. In a few months, we’ll see if it was a worthy experiment.